at the Old Sheldon Church ruins in beautiful Beaufort County in South Carolina. 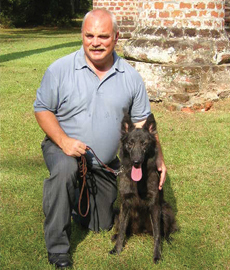 Rick's dog training business and kennel is located in Beaufort, SC about an hour south of Charleston. 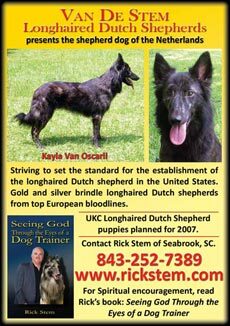 View Rick's longhaired Dutch Shepherds as seen in Dogs USA 2007. Hello! My name is Rick Stem and I want to welcome you to my website. This is the home of Van De Stem longhaired Dutch Shepherds. I am located in Seabrook, South Carolina, just outside historic Beaufort. Van De Stem longhaired Dutch Shepherds is committed to setting the standard for the establishment of the longhaired Dutch Shepherd in the United States. With gold and silver brindle dogs from the finest bloodlines in Europe, Van De Stem longhaired Dutch Shepherds is able to provide you with the best dogs available in the United States. If you are considering a longhaired Dutch Shepherd as a companion or protector of the family, please call about our litter planned for 2007. I want to share with you the professional dog training services I provide. With a background in police k-9 training, my obedience and personal protection training programs are able to provide you with the obedience dog or personal protection dog that you may be looking for. I have a number of programs available and the rates for training are better than competitive. Having trained dogs for hundreds of dog owners, I am very much aware of the dog training needs that dog owners have. No matter where you live, my programs are worth calling about. Let me help you in your dog training needs. Last but not least, I want to provide spiritual encouragement to you through my book "Seeing God Through The Eyes Of A Dog Trainer". Regardless of who you are and where life may find you, my book is able to provide spiritual encourgement like no other. This book was in fact written with dog owners in mind, though all who read it can benefit from it. I think it can be such a blessing to you that I provide a free copy of my book to everyone who purchases dog training from me. Everyone needs encouragement from time to time, and I believe my book is able to provide that encouragement everytime you read it. Thank you for allowing me to welcome you to my website. I look forward to hearing from you. May 2007 be a good year in all your endeavors as a dog owner. If this is your first time visiting my page you may find the links to specific pages at the top of the page. For those who are returning, we have changed the navigation somewhat to be more efficient. We now have direct links to each of our dog's page as well as breeding information and upcoming litters. Copyright 2006. RickStem.com All rights reserved. An Abe Stem Production. Any unauthorized reproduction is unlawful.